We’re excited to announce the first phase of a brand new Raken product. Starting today, you’ll not only notice a sleek new design of the web dashboard and mobile app, but you’ll find additional features that will make your daily reporting experience even better. This is just the start. Over the next few months we'll be rolling out our revamped Raken product in different phases, each highlighting additional features. Check out our announcement video to see it for yourself! Since our founding, we’ve put customer feedback at the core of our product roadmapping and development. In planning this redesign, we wanted to be sure to include the most common suggestions from our customers. Our goal has always been to provide you with a best-in-class field reporting solution, and these new features and design are sure to take your daily reporting to the next level. The first thing you’ll notice about the new Raken product is the updated design. The new design reflects the suggestions from our ever-expanding customer base and improves the intuitiveness and readability of the web dashboard and mobile app. The Raken mobile app is the core of our product. We know that a majority of customers exclusively use the mobile app, so we wanted to make the web and mobile experiences more seamless. The new mobile app design not only makes it easier to complete your everyday tasks but also gives you brand new insights into project updates, delays, missed dailies, and more. By redesigning the app with new analytics capabilities in mind, we were able to create intuitive charts, graphs, and summaries that allow you to digest information more efficiently. (Learn more about the new dashboard insights below). Starting from the ground up allowed us to prioritize our design based on the ways our customers consume information. The new desktop puts the information that is most important to you front and center. For example, missed dailies are now reported on the top of your activity dashboard, ensuring that you are equipped with the actionable insight you need to bring your team and project reports up-to-date. Additionally, the new “card” view on the activity dashboard surfaces information such as the weather, number of workers, and hours worked so you can get a better understanding of your various projects in one place. On top of the new design and user experience, we’re adding a few new features such as dashboard insights and on-boarding to add even more value to the Raken project. All-Time Stats. See the number of workers, hours, safety incidents, delays, missed dailies, compliance percentage, and open tasks per each project. Workers and Hours by Project. View the trends of your workers over a given timeframe. Top Users and Compliance. Get a list of the users by the number of dailies or entries they complete. The compliance report includes the number of missed dailies per project and the daily completion percentage for that site. Project Delays and Safety Incidents. View the number of incidents and safety issues per day per project in one simple view. Get to the bottom of the projects that need to improve safety or have an impending deadline. Open Tasks. View the number of open tasks per project in comparison to other projects to help you decide if and where you need to step in. Dashboard Insights is only available to Professional and Performance users. 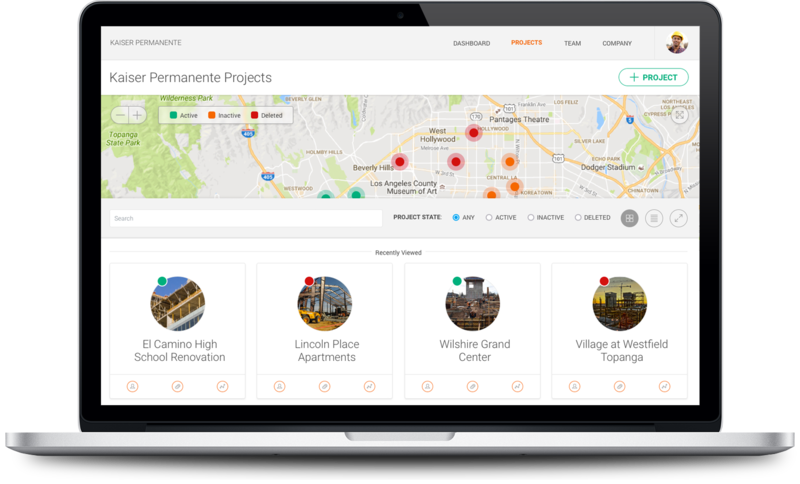 Our redesigned Projects tab gives you a better high-level view of your project details while making it easier to add new and update existing projects. The new Project Map View allows you to view your projects and their statuses on a map for even greater insight. You can also sort your projects by start date, zip code, status, and more, or choose to view them in a list or grid view. If you haven’t started using Raken yet, this update is for you! We’ve integrated a new on-boarding feature that walks you through the dashboard and app for the first time. Quickly learn where everything is and how to get started with your first project. Returning Raken users will also have a walkthough of these new Raken features when they return to the dashboard for the first time. We’re not done yet! In the next few months, we’ll continue to rollout additional features that fit seamlessly into the new Raken design. The redesigned user interface will be rolled out across every web and app page, and we’ll be introducing a few new surprise features that are in the works. Stay tuned! Want to see the new Raken for yourself? Get started below!